When I was a little girl, ten years before I became a Catholic, I had enough Christian sense to know that a person was supposed to go to church on Sunday. My parents weren’t that interested…they didn’t think it was necessary…besides there were so many children and Mama didn’t have a hat. But I was determined to go. The church was only a mile or so away; it was walkable. I persuaded my younger sister to go with me and endured her complaining all the way up Military to Cherry Hill, dragging her across the bridge over the Rouge River, which she was convinced was going to collapse and her life would end before her eighth birthday. But we made it, week after week, stopping halfway at the drug store on Michigan Avenue for Lifesavers and butterscotch drops. But I didn’t know all that then. All I knew was that Sacred Heart was the most imposing, mysterious, and beautiful church I had ever seen. It had arches and double doors and stained glass windows. It rose high above the busy street, like a Roman matriarch, with a dozen steps or so to the entrance. As we came out of the drug store and stood at the corner, waiting for the light to change, my sister and I watched the throngs of people filing into the church. The bells were ringing, and the people kept coming. I wished I could follow them inside. But of course I couldn’t. One didn’t choose these things. We had a duty to be Episcopalian. The light changed, but my sister didn’t move. She was staring across the street. I turned to see what she was looking at, and then I saw them. I forget how many. Six, maybe eight, walking in twos toward the church, faces down, their hands hidden in their voluminous sleeves. They seemed to glide across the sidewalk. Were their feet even touching the ground? My sister stared, transfixed, then turned and looked up at me. Her eyes were huge. “Why don’t we have Blue Angels at our church?” she asked. I didn’t answer. I couldn’t. Angels. That’s what they looked like. We knew nothing of nuns or priests or religious. We didn’t know the angels were Sisters of the Immaculate Heart of Mary, consecrated forever to God. Chosen Brides of Christ. Ignorant of that amazing, beautiful reality, we only knew there was something singular about them, something touching the supernatural. We could feel it. 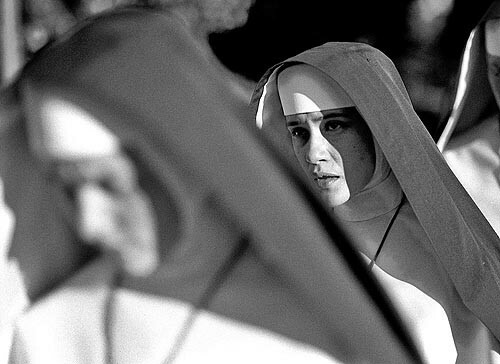 Two little girls sensed the forgotten truth: Nuns are women set apart. They live in a state higher than the rest of us. That’s what people don’t want to say—that some things and some people are higher than others. Catholics used to understand that better than anyone, but no more. Their perceptions have been flattened, their discernment dulled by a religious Declaration of Independence. They want to believe that everything is the same; that all men are created equal and stay forever equal. Nothing is better than anything else. Liberté, fraternité, égalité: the universal doctrine of the modern age. It’s so much easier now. Even in the spiritual realm, the Kingdom of God, they see no distinction, no honor, no hierarchy. Just get in the door. That’s all it is. Heaven is a place of equal opportunity. All rewards are equal. A martyr has no more glory than an adulterer who repents on his deathbed. There is no point to striving, no point to sacrifice, no point to turning from the pleasures of the world. This, of course, is nuts. It was the nuns who reminded us otherwise, and without them, Catholic culture withers and dies. We can’t do it alone; the family is not enough. Just as the mother in the home is the heart of the family, the center of devotion and sacrifice; so the sister holds that place on the higher level of religious life. She walks toward Heaven; and we see her commitment, her dedication, her honor. She is a daily reminder that this life is a journey, a pilgrimage. We have a race to win, and we must not run in circles. She embodies grace and beauty and modesty. She reminds the world of purity and humility. We are bereft without her. Where are the Blue Angels? Modern civilization is flattened now. Everything is secular, dry, horizontal. Our work, our entertainment, our shopping, our cars, our jet planes and processed food keep us rooted to the earth. It’s Babylon and we can’t see the Holy Mountain in the dark. While we struggle to keep tradition alive in our homes, we are divorced from Catholic civilization on the outside, touching it only at Mass and the few devotions we’re allowed. The nuns changed, that’s what. They were the bedrock of Christian civilization. They transmitted Catholic culture. They told the stories and sang the songs. Discipline was in their blood, and they taught the lessons of obedience and excellence and perseverance. They lifted the veil to the Other World. And now what do we have? Convents boarded up. Schools closed. For those few still open, there is low enrollment and outrageous tuition. Children are herded into the public schools or kept at home. Society is fractured. It didn’t happen by accident or even by choice. The sisters were redirected, often against their will. Their leadership pushed and shoved them out into the world, dreaming Teilhardian dreams, extolling the progress of mankind. The Omega Point was just ahead. Transformation beckoned. Some were happy to go. Embracing freedom, they abandoned their convents and their Rule, exchanging their beautiful habits for mannish suits and bad haircuts. Others knew their vocation was under attack. Many left. Some tried to adjust, keeping whatever small bits of their previous life they could, tucking away their memories with their holy attire, trying not to mourn. But their song is silent. I will never forget two nuns who were close to me: Sister Rosaria, my team teacher at St. Sebastian, who left, and Sr. Patsy,* my friend, who stayed. Those dear women embodied the conflict that raged in the Church in the sixties and seventies; they staggered under the blows to their Way of Life. Who could know the depth of their wounds? Who could know their suffering? Sister Patsy and I were in graduate school together at a Catholic university, studying psychology. She didn’t want to be there. She’d been a third grade teacher for nearly twenty years, a Dominican in full habit, espoused to Christ. She wore a wedding ring and had a different name. She kept the thin gold band, but the name given to her in religion, which she cherished as coming from God, was taken away. She had to go out into the world, the only sign of her consecration a small cross on a chain around her neck. She wore polyester pantsuits and curled her hair. She had to see patients at the clinic, but could not tell them she was a nun. It would be too traumatic for troubled people to be counseled by a religious, the Jewish professors declared. They would be reluctant to share their inner feelings. So she was Miss Brown, one of the rest of us, plodding along toward her advanced degree. I haven’t seen her in many years. I wonder if she’s still a nun. How many other sisters were there who had to relinquish what they loved? How many tears were shed? How much agony endured when the axe was laid to the root of the tree? Jesus had called them to Himself, to a holy way of life, and now they were forced into another. Is it any wonder so many left? And so few enter? I’m thinking of the active orders, now, the ones people can see. The loss of the teaching sisters shook the Catholic world to the core. No matter how valiantly parents and lay teachers and the handful of nuns here and there struggle, it’s not the same. The Catholic school—the locus of formation, second only to the home—has been weakened. Tradition has been trampled. Without the nuns pointing the way to higher things by precept and example, there can be no full restoration. Just as priests are the sign of Christ in the world, so the nuns are the sign of Mary. They are the visible heart of the church, the sign of oblation, the sign of love. We need them. And we need them in full habit in the schools. What difference does it make? one might ask. It’s what’s inside that counts— the inner perfection, the virtues and strengths of the individual. Sure, I answer. But that’s not immediately discernible to the rest of us. I know some nuns, and I honor them. They are lovely women, dedicated and devout, but it’s not the same. Their commitment appears more individualistic now, even though they belong to an order. Apartments, cars, and laptops don’t resonate in our hearts the same way as wimples and veils. The culture would be lifted if they returned. Amazing things would happen. The world would be so much better. More refined. More respectful of the feminine ideal. Just think of it. Sisters teaching. Sisters living in community. Sisters singing their office. Each one exercising her talents to the best of her ability, reaching for the Kingdom of God, pushing, prodding, cajoling the half-awake student to something higher, something better, something permanent and true. We would all have something to admire and emulate. Something that would ignite the flame of holiness, the desire to seek the summit of perfection. Something that would remind people that Heaven can, indeed, begin on Earth. O, dear Lord, call them back. Bring the Blue Angels home.